We’ve compared every popular luggage cart in terms of price, weight, size, features, and carrying capacity; we’ve also considered reactions from online reviewers (eliminating the fakes!) and luggage brand reliability as reported by America’s Consumer Reports and European consumer organizations. While for travel purposes we tend to prefer both large or carry-on wheeled travel packs, there are times when a good luggage cart is the right choice for some people. If you’re travelling in a small group and especially with kids, it can be useful to be able to combine luggage pieces onto a single cart. And if you have a lovely-but-wheel-less luggage piece that you’re attached to, and you want to be able to roll it, luggage carts are of course the way to go. For a luggage cart that can carry a reasonable load, folds up compactly, and doesn’t weigh too much itself, we prefer the Samsonite Luggage Compact Folding Cart. It currently has the best available combination of these characteristics, and the Samsonite brand is well established and its luggage products do well with consumer tests. Originally published: July, 7, 2017. Updated on July 18,2018. As usual, we looked for every scrap of information out there on the most popular carts out there (full listing and specks charted at the bottom of this post) to come to our determination. But luggage carts are not the objects of travel bloggers’ eyes, nor do they get much attention from the consumer testing organizations whose insights we pull together for our meta-reviews. Luggage carts are generally fiddly things and are sold cheaply and without warranties. If you want something that will really last and hold up, check out our recommendations for more durable luggage options with wheels. Nevertheless we feel confident in recommending the Samsonite Luggage Compact Folding Cart as the best option out there right now. After eliminating the carts with mostly poor or fake reviews, we compared compactness versus how much weight they can carry. For example, the Travel Smart by Conair Super Mini Cart is cute and very portable, but with a maximum carrying capacity of only 20 pounds is inappropriate for most real-world travel applications. The Samsonite Compact is the folding cart that hits a happy medium of sturdiness and light weight with its combination stainless steel and plastic construction. It telescopes down to just 10.5 by 15.5 inches (26.7 by 39.4 cm) making it definitely small enough to slide into standard carry-ons, and it weighs just 2.8 pounds (1.27 kg). 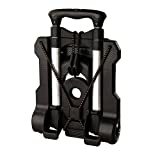 The 15.5 inch (39.4 cm) base and adjustable support strap anchors help keep its load firmly in place and discourage rocking or tipping when you’re pulling a larger or more awkward piece of luggage. The many hundreds of Amazon reviewers (who are real for this product; they pass FakeSpot’s test, which we checked for every cart) are mostly positive on the Samsonite Compact; they appreciate mainly its small size and that it has held up over time. Complaints include tipping and trouble with heavier/bulkier loads; for sturdier, bigger carts that don’t fold down quite so small, see our recommendations in the next section. It’s also quite worth noting that Samsonite as a brand generally does well with consumer organizations’ testing and surveys on luggage brands, including America’s Consumer Reports, France’s Que Choisir and the UK’s Which?. The Samsonite Compact is priced similarly to its competitors; you can check the latest on Amazon. As of this writing it is (oddly) not available directly from Samsonite. If you’re willing to carry just a bit more weight and bulk, the standard Samsonite Luggage Cart is a great choice. Its platform is a bit larger, which gives it more stability in order to prevent tipping if you’re moving fast with an unwieldy load. Otherwise it’s quite similar in design to its compact sister above. It folds down just a bit less compactly to 19 by 11 by 3 inches (48.3 by 27.9 by 7.6 cm) and weighs 3 pounds (1.36 kg). We recommend purchasing the larger Samsonite Luggage Cart directly from Samsonite via that link because the item listing on Amazon appears to be getting complaints from customers who mistakenly are sent the Compact version when ordering. The next step up is the Magna Cart, which is quite popular worldwide and has lots of glowing (real) customer reviews. It has a carrying capacity of 150 lbs/68 kg (more than twice that of the Samsonite Folding Cart), solid aluminum construction, and 5-inch (12.7 cm) rubberized wheels. At 7 pounds and folded dimensions of 25 by 15 by 2.5 inches (63.5 by 38.1 by 6.4 cm) this is overkill for most people for airplane luggage. But if you’re travelling over land and need to be ready to haul bigger items without breaking your back, this is useful to have at your side and to be able to fold up when no longer needed. It doesn’t come with bungee cords so you may want to purchase those separately if you don’t have any. There’s lots of carts and hand trucks out there at all price ranges and for all uses; these are the ones that we feel are most likely to benefit travellers with luggage to schlep around.